Bursting with bright ideas to inspire both teachers and students, Kid's Box gives children a confident start to learning English. 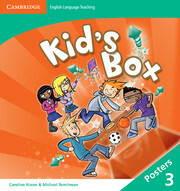 This special edition of Kid's Box ensures that the needs of the Greek-speaking learner are reflected in the new content and unique sections dedicated to problematic areas of the English language. It also fully covers the syllabus for the Cambridge Young Learners English (YLE) tests. 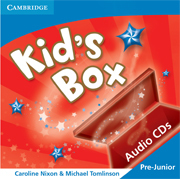 These audio CDs contain all the listening exercises, songs and stories from the Pupil's Book and Activity Book Pre-Junior, helping young learners to practise the target language in a fun and creative way.